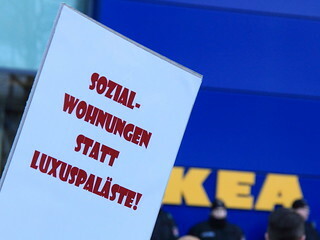 1.500 people marched through St. Pauli and Altona against gentrification and for a real turnround in urban development. The city of Hamburg still is developing many urban areas against its citizens. It’s destroying quality of living by acting as a company but not as a social player. Council properties are assigned to “the market” leaving no chances of regulation or planning participation to its citizens. This leads to increased rents, for local housing and trade. People with mid and low income as well as local business owners, are no longer able to afford living and working in their quarters. Multinational projects, such as Ikea in a dense housing district, may increase the reputation of one quarter, but does no good to the people living there. Vocabulary such as attractiveness, lighthouse-projects and concentration are phrases in the eyes of the local population, as long as there is no real participation for these people.